The rose fish, often referred to as the ocean perch, is a marine bony fish hailing from the Sebastidae family. The fish is moderately flat, and about one-third as tall as it is in length. The large bony head is a surefire giveaway of the species. Fishermen know exactly what they’re after while out on the water. Adults are often found at depths of 100 to 1,000 meters, though the juveniles are often found closer to shore. Key West is the perfect spot to track down a few rose fish. At Captain Moe’s Lucky Fleet, we use the latest gear and boats to bring you further out faster. The rose fish is commonly known as a food fish, as it is consumed by numerous species, including human beings. Adults are usually found just off the coast, while juveniles are a bit closer in coastal waters, such as in fjords. The individuals may live up to 75 years and enter their reproductive state somewhat late for a fish species. This also means there are plenty of the species to catch while out on the boat with Captain Moe. The rose fish is often found at great depths, which means deep dropping is required to capture them in their natural habitat. Amateur fishermen may not have the skills or equipment to handle such techniques, but our fleet and crew members certainly do! We’ll walk you through the entire process of catching the species of fish while we’re out on the water, ensuring you have the time of your life without walking away empty handed. 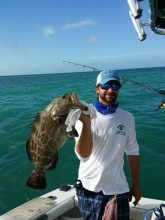 If you’re ready to schedule a fishing trip here in beautiful Key West, look no further than Captain Moe’s Lucky Fleet. We have the reels and rods to get you started. Give us a call at 305-304-8065.